The iconic Senedd building in Cardiff provided the setting for a Cariad Interactive paper prototyping workshop with the Gesture-based Professional Learning Community (PLC). Neil Mendoza took on the tricky programming task, while Pete encouraged participants to quickly communicate ideas on paper. The PLC added some interesting ingredients and challenges for the interaction designers, as they playfully explored how rhythm could enrich the learning environment of young people with severe learning difficulties. The winning pitch resonated inclusivity, showing that an inclusive design is something that can excite all of us. 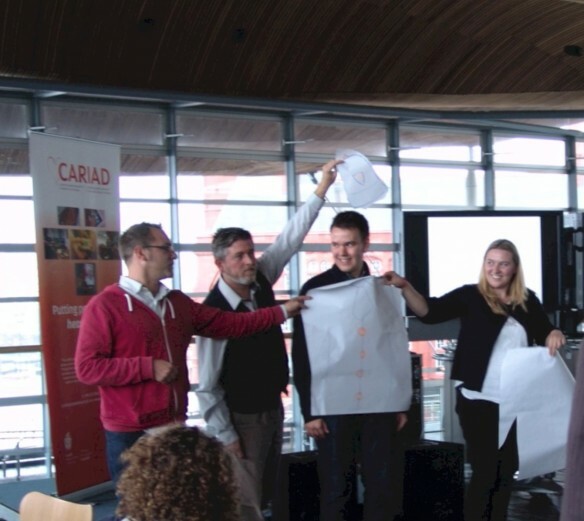 This one day-workshop is to be hosted at the iconic Welsh Assembly Government Senedd Building at Cardiff Bay. The workshop is one in a series of activities organised in partnership with the Professional Learning Community (PLC) in Gesture Based Communication in Wales. Anthony Rhys, founder of the PLC, is providing us with a creative challenge in designing for disability. This gives us an opportunity to try out our Paper Prototyping workshops with key stakeholders from disability networks in Wales. The short session delivered for Hirstwood Training covered how to use ReacTickles Magic and Somantics to experience sensations such as squash, stretch, push, pull, press, reach, tap, tickle and so on, where action and reaction are closely matched. 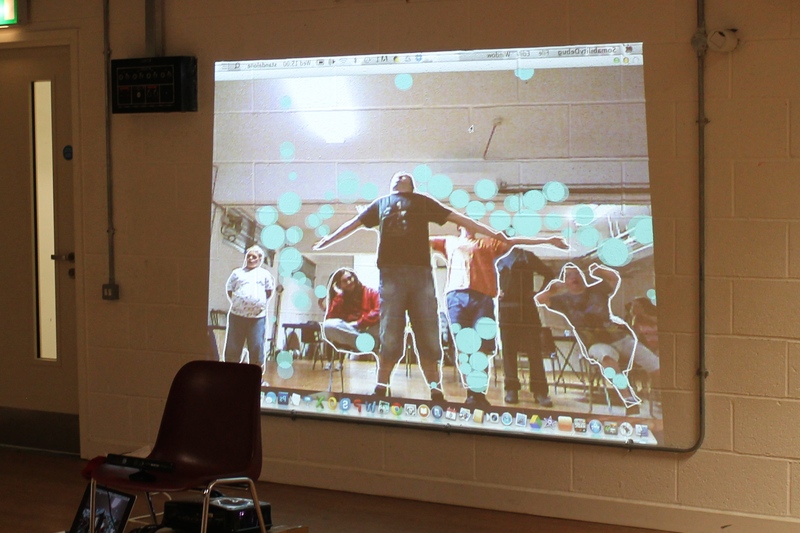 Input data also included sound and movement, enabling users to capture, observe and create images with their bodies. As both these applications do not require previous experience of technology they can increase the inherent accessibility of the iPad. The abstract design adds to this inclusivity, as both children and adults can discover meaning through action. The session demonstrated how to trigger imaginative responses and expressive communication rather than to teach skills. I asked the audience to think about the iPad as a medium rather than a tool, particularly when projected. The amplification afforded though large scale projection supports gross motor movement and rhythm, creating possibilities for empathic, co-located interaction. Drawing on case studies and video testimonies, the sessions evidenced how these minimal interfaces have enabled users, some with the most profound disabilities, to quickly gain confidence in their ability and a sense of mastery. to establish cause and effect, and encouraging the use of Tools For Touch, in order to generate confidence in Direct Support Assistants and other staff in using our technologies. We then referred to video testimonials and started to explore Somantics, whilst at the same time learning about the benefits of Body Schema & Mirrors and Gestural Communication. Finally, we looked at Staging The Action: how to set up a simple system – anywhere! Although we were running short of time, I briefly introduced Creative Movement: body awareness, weight, space, rhythm, moving with others, and provided the Day Centre with written documentation that explains how to encourage creative movement in adults with profound learning difficulties. We left and camera system at the Day Centre for a week, which they have been able to set up themselves and explore in their own time. The Feedback and documentation is available on request.